For its coverage of the 2017 AFL season, Seven has restructuted its on-air team. 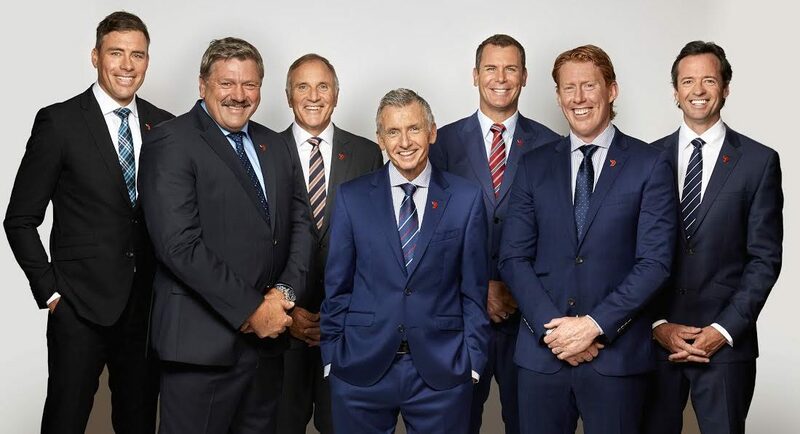 Brian Taylor is joining Bruce McAvaney on Friday nights, while Hamish McLachlan is joining McAvaney on Thursday nights. Basil Zempilas is calling Saturday nights with Luke Darcy. Tim Watson, Leigh Matthews, Cameron Ling, Wayne Carey and Matthew Richardson all return to the expert comments chair, along with field commentators Nick Maxwell, Jude Bolton, Andrew Welsh, Peter Bell, Mark Soderstrom and Brad Sewell. Three-time premiership player and Brownlow medallist Jimmy Bartel joins the team as a field commentator, along with Melbourne AFLW team captain Daisy Pearce. All together the biggest names and best callers in the game bring with them over 3,000 matches and 26 premierships. Sam Lane and Mick Molloy also return in the Saturday night pre-game alongside Darce, Richo, Lingy and Sam McClure with The Kick, a light-hearted hour of fun and footy news from 6.30pm each week. Seven News chief football reporter Mark Stevens will bring all the latest news to the AFL coverage throughout each weekend. McClure joins the Seven coverage with Footy Central on Friday and Saturday nights. Sam again joins the panel as the resident news breaker on Talking Footy. The Front Bar also returns with Andy Maher, Sam Pang and Mick Molloy sharing a laugh about the week in AFL and catching up with stars of yesteryear and today. The Front Bar kicks off with a special live show after the season opener Carlton v Richmond on Thursday night. After a highly successful inaugural AFLW season, Seven will broadcast the AFLW Grand Final as the Lions take on the Crows live this Saturday afternoon. Seven will again broadcast VFL, SANFL and WAFL matches live, free and exclusive. VFL will be broadcast live on Channel 7 in Melbourne, as well as the VFL finals and Grand Final. Channel 7 and 7mate will broadcast the SANFL and WAFL match of the round in SA and WA respectively, along with finals and the Grand Final. • Thursday Night Football – back with at least seven games on Seven. • Talking Footy returns next Monday night with Luke Darcy, Tim Watson, Wayne Carey and Sam McClure. • Game Day returns this Sunday 10am hosted by Hamish McLachlan with Jude Bolton and Nick Riewoldt. Bulldogs banner writer Danny McGinlay joins the show every week for his take on the footy world. Thursday Night Football is back with at least seven huge games including the Carlton v Richmond season opener. Friday Night Football is the big stage, kicking off most rounds and setting the agenda for the weekend’s footy with the game’s biggest stars. Saturday Night Footy is back again starting with The Kick’s irreverent and edgy take on the footy, including comedian Mick Molloy in the pregame. Fans enjoy a full preview on Sunday Football from 2.30pm with the Sunday Soapbox, including Leigh Matthews and interviews with the biggest stars. The Front Bar returns with Andy Maher, Sam Pang and Mick Molloy sharing a laugh about the week in AFL and catching up with stars of yesteryear and today over a drink. Darce, Richo, Lingy, Sam Lane, Mick Molloy and Sam McClure return with The Kick, a light-hearted look at the footy each week in the lead up to Saturday Night Footy from 6.30pm AEDT. Seven’s iconic AFL chat show Talking Footy returns in 2017 at 7.30pm Monday on 7mate with host Luke Darcy. Hall of Fame greats Tim Watson and Wayne Carey are joined by news breaker Sam McClure to dissect all the AFL news and issues, on and off the football field. Hamish McLachlan and the current stars of the AFL sit alongside the heavyweights of Seven’s commentary team every Sunday morning at 10am to review and preview all the weekend games. Footy Flashbacks, hosted by Dennis Cometti, takes fans on a trip down memory lane each week, looking back at some of the most memorable matches and moments in the history of the game. With a much deserved place in the Sport Australia Hall of Fame, Bruce McAvaney is widely renowned as Australia’s pre-eminent sports broadcaster, with an unbridled passion for AFL. The rousing and colourful Brian Taylor steps into the Friday Night Footy and Sunday Footy callers’ chair in 2017. BT began his playing career at Richmond before moving to Collingwood where the full forward kicked 100 goals in 1986 to win the Coleman Medal. Tim Watson is truly one of the AFL greats, an Australian Football Hall of Fame player and triple premiership star with Essendon, renowned for his skill and explosive bursts of pace. An articulate and insightful observer of the game, Tim also presents sport for 7 News Melbourne each weeknight. A Geelong premiership captain, Cameron Ling was one of the most respected players in the game with three flags to his name. Lingy has proven to be a natural in the commentary box and highly popular with fans, players and coaches. Arguably the greatest player of all time, two-time North Melbourne premiership captain Wayne Carey will again deliver his insights and opinions on Friday Night Football and Talking Footy. An Australian Football Hall of Fame Legend, Leigh is a winner of four premierships as a player and coach, a captain of Victoria and eight-time Hawthorn Best & Fairest. When Leigh speaks, in his forthright and pragmatic manner, he sets the footy agenda. Richmond champion and crowd favourite Matthew Richardson is back on Friday and Saturday nights on Seven’s AFL coverage. One of Tasmania’s favourite sons, Richo amassed 800 goals in an acclaimed playing career, including the most ever at the MCG with 464. The highly respected former Bulldogs star is regarded as one of the most successful ruck-forwards of the modern era. A winner of the Leigh Matthews Trophy as the AFL Player’s Association’s MVP, the father of four has carved out a burgeoning career as a radio and TV personality. Hamish McLachlan is one of Seven’s most versatile sports broadcasters, hosting and presenting at Seven’s horseracing and tennis coverage, as well as calling AFL. In 2017 Hamish will call Thursday nights and Sunday Football, as well as hosting Game Day and Friday Night Countdown. Basil Zempilas will lead the Saturday Night Footy call in 2017 as well as several Perth prime time matches. Basil is an acclaimed TV host, reporter and commentator, having covered AFL in Perth for over 20 years, as well as calling at six Olympic Games. Award-winning sports broadcaster Jason Bennett, an AFL commentator from 2002-2006 before embarking on an international posting with ESPN and their popular program Aussies Abroad, has been back calling footy on Seven since 2015. Comedian and self-confessed Tigers’ tragic Mick Molloy returns with his ‘voice from the outer’ taking aim at everything in the game. An award-winning AFL news-breaker and analyst, Stevens will work across Seven News, Seven’s AFL broadcast and online platforms. He is a past winner of the AFL Media Association’s award for best news-breaker and best feature writer. Sam Lane is again back on the pregame panel asking all of the searching questions of the players, coaches and administrators, as well as enjoying the lighter side of the game. Sam is a past winner of a Melbourne Press Club Quill award as well as the AFL Players’ Association and AFL Coaches Association football writer of the year awards. In 2017 award-winning journalist Sam McClure joins Seven’s AFL coverage from Footy Central, as well as resuming his news-breaking role on Talking Footy. The 2007 Brownlow medallist joins Seven as a field commentator to impart his knowledge on the game. A three-time premiership player and 2011 Norm Smith medallist, Jimmy’s finals record is the envy of many and he stands alongside the greats in our game. Mark played a total of 121 SANFL games for North Adelaide, Glenelg and Sturt. A 7 News sports presenter in Adelaide, Mark again takes to field commentary in Seven’s 2017 AFL coverage. Collingwood premiership captain Nick Maxwell joined Seven’s AFL commentary team full time in 2015, having previously worked as a guest match analyst and AFL Game Day panelist with Seven for four years. Fans can look forward to more of his honest and forthright assessments. The captain and marquee star of Melbourne’s AFLW team, Daisy has also made an impressive start in the AFLW commentary box with articulate insight into the game. Daisy is also a regular panelist on Game Day. Swans dual premiership hero and 325-AFL game veteran takes up a field commentary role again on Seven’s AFL team. Known for his undying determination and brutal attack on the football, Jude shares the AFL record for the most number of tackles ever in a single game with 19 and recently joined the Sydney Swans Hall of Fame. The former Essendon defender and vice captain is a polished TV performer. Welshy is a Game Day regular who brings a fun and affable approach to his Seven commentary. Two-time Hawthorn premiership player and 2007 best and fairest continues with Seven in a field commentary role. Brad was widely respected in the AFL as a tough inside midfielder and viewers know his commentary as thoughtful and incisive. Australian Football hall of Famer, dual North Melbourne premiership player and Fremantle captain, Peter Bell returns for his field commentary role out of Western Australia.